Rodelinda, HWV 19: Pompe vane di morte!…Dove sei, amato.. Turning to the present CD, one hardly knows whether to begin by praising the repertoire – all arias presumably sung by Senesino – or the singer. 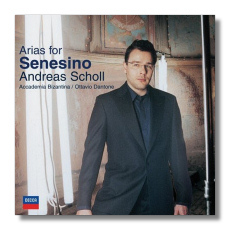 Scholl performs arias from Handel's Flavio, Rodelinda, Giulio Cesare in Egitto, and Rinaldo. Several of these are quite familiar (as arias by Handel go), and the fact that Scholl sings them gorgeously comes as no surprise. Although he is a true countertenor, his vocal quality is attractive and convincingly masculine; surely this is the best of both worlds. His voice is evenly produced and tonally consistent from the bottom to the top of its range. Stylistically, he is an expert in the Baroque repertoire, and if we cannot tell whether or not his voice per se sounds like Senesino's, we can guess that his manner of singing (and appropriately embellishing) this repertoire probably is quite similar. Senesino is supposed to have been a good actor. Scholl is a good actor too. We can't see this on a CD, of course, but he acts with his voice, giving every character, every situation, and every emotion its due. From the heroics of "Al lampo dell'armi" (from Giulio Cesare) to the vivid terror of "Va per le vene il sangue" (from Porpora's Il trionfo di Camilla), Scholl has (and does) it all. Handel's operas are no longer forgotten, but what about the operas of Tomaso Albinoni, Antonio Lotti, Alessandro Scarlatti, and Nicola Porpora? This CD whets one's appetite for more, because there's not a dud among these 11 arias. Handel was not the only successful opera composer during the first part of the 18th century, after all, and Scholl's program gives us a taste of what some of his contemporaries were up to. Thanks to libraries in Schwerin, Berlin, Dresden, and Bologna, the editorial work of Alessandro Borin, the singing of Scholl, and the musicianship of Ottavio Dantone and the Accademia Bizantina, the curtain has been raised another few inches. It has been said that opera as a whole is moribund today, but this CD is further proof that Baroque opera never has been healthier. Dantone and his ensemble of 18 musicians accompany Scholl with dynamism. Some of the introductions to these arias are quite lengthy, which gives the players their own chance to shine. The booklet contains texts and translations, plus a short essay on Senesino by David Vickers. This CD is a triumph for both scholarship and entertainment. Hear it, and hang on to your… hat!